The mission of Fish & Loaves is to unite churches, concerned civic groups, the private sector, and individual men and women of faith in a community partnership to ensure that no one goes hungry or without adequate nutrition in Downriver. St. Paul United Church of Christ is a charter congregation of the Fish & Loaves Community Food Pantry, a cooperative, non-sectarian, non-profit, faith based initiative seeking to insure adequate food and nutrition for all residents within seven local communities: Allen Park, Brownstown Township, Dearborn Heights, Romulus, Southgate, Taylor and Woodhaven. Fish & Loaves is also committed to working together with other agencies, civic bodies, fraternal organizations, and private sector businesses in the wider Downriver area and western Wayne County to maximize food resources available in responding to personal and community wide emergencies. Underscoring our congregation's commitment to Fish & Loaves as a community food ministry, St. Paul senior pastor, Rev. 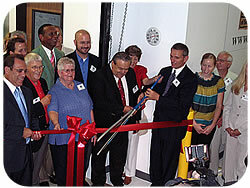 Geoffrey Drutchas serves as president of the community ministry. More than a half dozen other churches, Protestant and Roman Catholic, are also represented by board of director participants. With the support of St. Paul United Church of Christ and other congregations, Fish & Loaves has established a central "client choice" pantry that allows individuals and families to "shop" on a monthly or bi-monthly basis for items they need, including fresh seasonal produce, dairy products, refrigerated foods, and meats.The client choice pantry is the most effective way to affirm the dignity of those helped, while minimizing waste because clients only take what they are likely to use at home. 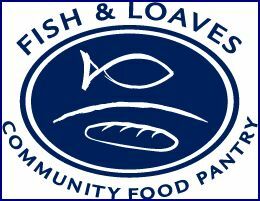 The Fish & Loaves Pantry is located adjoining the new Gleaners Food Bank Warehouse on Northline Road, just east of Beech-Daly in Taylor, approximately two miles from St. Paul United Church. As a non-profit ministry which does not charge for any services provided, Fish & Loaves continues to depend upon financial and in-kind donations from St. Paul United Church of Christ and other local congregations for its successful operation. St. Paul United Church supports Fish & Loaves by regularly collecting food, providing financial support, and encouraging our own members to volunteer their personal time and talents to help with all Fish & Loaves projects. The food collection bin for all donated canned good and dried food products is located in our church's narthex, just outdoor our sanctuary. For information about how you can volunteer for the Fish & Loaves ministry, call the St. Paul Church office at 313-291-1221.